There was a time that we used old milk crates to hold up a beautiful wooden table top we found in the garbage - to make a coffee table. However, these really do look cute and would make a great addition to the playroom - or even classroom! They are seats - made out of file crates. 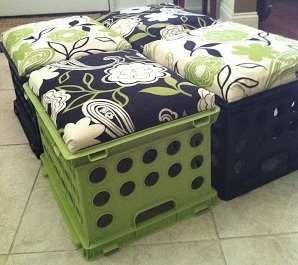 You just make a cushion (out of plywood, foam, and fabric - staple or hot glue gun in place) to place on the crate. For little children, you could place the cushion on the open top of the crate, and use the inside of the crate for storage. For an older child or teen, you need to put the cushion on the bottom side of the crate, and use the crate with the open side down. Using a vinyl tablecloth for your seat covering fabric would make your seat easy to clean - and great for outdoor use! Jessica Lyn Larrew posted: I think the kids would love these for playing games at the coffee table, playing video games, or as footrests!! Lori Weaver Razzano posted: Nice! Brooke Ashley Perkins-Vails posted: Pretty Nifty Idea !! Kristen Ann Jones Schirmer posted: My sister is using them in her classroom! The link to the plywood on Amazon, is that the correct size already cut?? that would be AWESOME! It would depend on which crate you bought - the cut wood is 12" x 12"